Let’s go back to 1576, and the birth of the London commercial stage. In March of that year, Oxford returned from Italy with knowledge and ideas about creating theaters in England. It may be that even before he left, he and his patron the Earl of Sussex, who, as Lord Chamberlain of the Household was in charge of Court entertainment, discussed the need for particular stages, due to the recent loss of the use of theater inns by order by the Privy Council three months before Oxford’s departure. England had known temporary stages for centuries, bleachers with a roof, thrown up in a field for a season, only to fall down, burn down, or be knocked down for fuel or timber. Recently, boredom brought on by the Reformation’s destruction of the Church calendar of feast-days had led to an increase in City inns specially equipped for plays and other shows, which had then led to the Privy Council order of December 26, 1574: “no inn-keeper, tavern-keeper, nor other person whatsoever within the liberties of this city shall openly show, or play, nor cause or suffer to be openly showed or played within the house yard or any other place within the liberties of this city, any play,” etc. Thus were the battle lines drawn for the theater war that would absorb the energies of artists and patrons for the rest of the century and halfway through the next. Burbage’s stage was unique in several ways. Like the temporary seasonal stages it was purpose-built, that is, unlike the inns, its only purpose was performing plays and other “activities.” But unlike the temporary stages, it was built to last, which indeed it did, for twenty years. Also, the actors could charge an entrance fee, unlike either the open air stages or the inns, where they could only pass the hat. And most unusual of all, as has been determined recently, it was also round, or as round as human ingenuity could make it out of timber, lathe and plaster. That any stages before Burbage’s were round in form seems most unlikely. On his travels around Italy in 1575, if Oxford visited Vicenza, 50 miles west of Venice, he might have seen temporary round wooden stages built by Andreas Palladio as a dry run for the Teatro Olympico that he began building (of stone, not wood) ten years later. It’s an accepted fact that Palladio built to plans made by the ancient Roman architect, Vitruvius. Oxford too could easily have known Vitruvius from his tutor’s library. That Burbage’s round stage was made of wood and plaster meant that it would vibrate to sound (Vitruvius, Chapter 5, #7) sending the actor’s voices through the theater so that they could speak in a normal voice and still be heard by thousands. While public demand could be met by a big yearround outdoor theater somewhere easily accessed by both Londoners and travellers, for the posh Westminster audience it was easy access to a private indoor stage. The public theater would be built according to Vitruvius, a round space made of wood and plaster that would resonate like a wooden instrument––a violin, viola, or big drum––making it possible for actors to perform to thousands without having to shout to be understood (Vitruvius, Chapter 5, #7). They would build it in the Liberty of Norton Folgate on Bishopsgate Road that brought travellers from the North into and out of London, land that before the Dissolution had belonged to the Earls of Rutland, where Oxford’s companion of his teens still owned property and where in 1576 he still maintained the kind of authority that could support and protect it. Once built, the theater could support itself and its crews on box office and on sales of food and drink. The private theater would be similar to the one at Paul’s, a chorister’s school with a small theater where the Children of the Queen’s Chapell could rehearse their Court performances, and where, without making too much of it, Burbage’s adult actors could also perform for select audiences drawn from the community of law students, parliamentarians, lords and clerics that surrounded Whitehall and Westminster Abbey. The most logical place for this was in one of the apartments in the old Blackfriars monastery where the choristers of the Court, both children and adults, had been rehearsing for holiday entertainments since the days of Henry the VIII. As for getting the stage to pay for itself, it was clear that the boys at St. Paul’s were making money from shows put on at the little theater nestled in a corner outside the Cathedral simply by continuing to perform their Christmas routine for the public weeks after any there was any need to rehearse for Her Majesty. It seems things went smoothly enough at the theater/school until 1581 when Oxford got banished from Court for failing to live up to his masquerade as Elizabeth’s languishing lover (artfully depicted by Bacon in Lyly’s Endymion). When Oxford, furious at being ignored by the Queen and abused by her courtiers, quit writing her holiday comedies, his cousin Francis stepped in, producing the kind of plays she liked (all later attributed to John Lyly), thus freeing Oxford to concentrate on adult plays for the West End. These created a demand, and soon the little theater was packed for every performance. Even so it was probably less the traffic that roused the anxieties of the landlord than the plots of plays like The Spanish Tragedy and early versions of Hamlet, Timon, Coriolanus, Romeo and Juliet and Julius Caesar in which Oxford took swipes at members of the Court community. What happened after 1584 when the landlord won the right to evict the theater/school? Since it remained in the hands of Lord Hunsdon (Smith 156), who ten years hence would form Shakespeare’s company, and since no other single purpose theater was built within or close to the West End during that time, it’s possible, even likely, that the theater at least continued to operate until 1590, when Hunsdon’s lease ran out. He asked to have it extended, but the landlord claimed he needed it for his family––a fib, since he quickly leased it to a prominent pharmacist, to whom he later sold it. In 1587, Marlowe and actor Edward Alleyn, formerly with Burbage and Oxford, decamped from Shoreditch, probably taking scrivener Thomas Kyd with them, to join Richard Henslowe at his new Rose theater across the river. Oxford and Bacon, angry at what they saw as ingratitude and concerned about the trouble it would bring down on everyone in the acting and clandestine writing community, lashed at them in pamphlets, but the young apprentices in the Southwark audience loved Tamburlaine, and rioted when, for whatever reason––history’s guesses in such matters are unreliable––the Rose was closed at holiday time. As the 1580s progressed, the Cecils, horrified at the direction the newborn commercial Stage and Press were heading, could do little so long as patrons like Walsingham, Hunsdon and Howard constituted a majority on the Privy Council. Their break finally came with the death of Walsingham in April 1590. Although the Queen refused to yield to Burghley’s immediate request that his son Robert take Walsingham’s place, she was stymied to find another, better, successor, so Burghley stepped in to deal with the paperwork, handing over the running of the former Secretary’s intelligence agency to his son Robert. Until now Robert Cecil had been held in low esteem at Court. Pitiful in appearance, barely five feet tall, with a twisted spine and spindly legs, the gorgeous creatures surrounding the Queen saw him as a nonentity whose place among them was due solely to his father’s importance. Once given room to act, however, it wasn’t long before little Robert revealed his own brand of genius, recovering for the Crown much of the wealth stolen from a confiscated Spanish carrack in 1592 and dealing with a number of other situations with an intelligence and dispatch equal to that of his old man. Among these was the need to regain control of the Media, a difficult issue since patrons of the most offending acting companies were members of the Privy Council while two of the worst offenders in print were members of his own family. It was easy enough to dismantle Paul’s Boys, something Cecil did immediately (apparently they had no influential patron). A few months later, now on the Privy Council, he made his first move to take down the author of the rabble-rousing Tamburlaine. Was it about then that a private message from Cecil, or his office, spurred Oxford to discontinue publishing the Robert Greene pamphlets, with their warning to Marlowe to give over his “atheistic” writing? If so, the young radical’s response was a play on another politically dangerous subject, the assassination five years earlier of the head of the Catholic party in France. The counterfeiting sting the year before had failed to net him, but with the return of the plague in early 1593, the phony Dutch Church libel that appeared like a call to riot, brought the reckless playwright within Cecil’s grasp. It’s a toss-up whether Marlowe was in fact stabbed to death in Deptford, May 30, 1593, or was instead smuggled out of the country on a ship docked nearby, the corpse they buried as his actually that of John Penry, Martin Mar-Prelate’s printer, executed the day before at an inn on the road to Deptford. If the former, then it’s an open question why they picked the town of Deptford or waited 10 hours before making their move. If the latter, it’s testimony, not only to Cecil’s skill at “black ops,” but equally to his concern that had he had Marlowe killed, one or another of the poet’s noble patrons might retaliate. Cecil may have been acting in Walsingham’s place, but he was well aware that he was still far from secure in the office. Marlowe’s elimination was followed a year later by the murder of his patron, Ferdinando Stanley, Lord Strange, recently turned Earl of Derby, a man of great influence in his domain in the north, and with a dangerous claim to the throne (there may have been political implications in the Massacre at Paris, the last play he wrote while in Stanley’s service, but it’s hard to tell since all that survives is half a normal play’s length). With this went the potent if silent warning to other patrons not to allow their companies to play fast and loose with little Robert Cecil. A frightened Bacon published the snivelling Christ’s Teares while the rest of the University Wits dispersed to other occupations. That winter, where normally at least six to eight plays would be given at Court by two or three companies, a single play is recorded, and that by the Queen’s Men, the last time actors using this name are recorded as entertaining at Court. In the months following Marlowe’s murder, the Queen’s cousin, Lord Hunsdon, long time patron of actors and now her Lord Chamberlain, joined his son-in-law, Lord Admiral Charles Howard, another long time theater patron, in a combined effort to save the London Stage (Gurr Playing). To do this, they had to negotiate with the Cecils, Archbishop Whitgift, and the other bishops and mayors who hated the stage and wanted to see it gone. That we have so little evidence of these negotiations may be because no one wanted the Queen to know any more than she had to about the connections between the Court and London stages. There’s very little evidence that the Queen had any idea of the close connection between those who wrote and acted her winter entertainments and the plays performed beyond the walls of her palaces. The patrons of course wanted to see the stage flourish, but they were also jealous of their prerogatives and did not want to see all theaters treated equally. Also, both Hunsdon and Howard had a stake in keeping the peace in jurisdictions where the stages were located. Gurr sees some evidence that they made another deal in 1594, this one with the Mayor, that with the two licensed companies moored at public theaters in the suburbs outside the City, there would be no plays allowed within the City walls (Gurr, Peculiar Letter). If true, while this gave control of the London Stage to the two councillor patrons, it also acknowledged the City’s most pressing concern, that their citizens not be exposed to epidemics or excited to riot. By the following winter of 1594-95 the pattern for the next decade was already in place, with three plays by the Lord Chamberlain’s Men under Hunsdon and three by the Lord Admiral’s. The new Lord Chamberlain’s Men was basically the defunct Lord Strange’s Men with Richard Burbage replacing Edward Alleyn. Alleyn plus what remained of Lord Strange’s company were now the Lord Admiral’s Men. They would continue to use Henslowe’s Rose Theater in Southwark, while Hunsdon’s company would continue to use Burbage’s Theatre in Shoreditch (Gurr Company 1). It was probably at this time also that Hunsdon and Burbage, having lost the lease to the theater/school at Blackfriars, began making overtures to Sir William More to purchase the great Parliament Chamber at Blackfriars. Funny how Fate arranges things. Or maybe it wasn’t Fate alone. Because Essex, whose role in this media war is still unclear, was away on his Cadiz adventure, Elizabeth, who dreaded his tantrums, took the opportunity of his absence to give his rival Robert Cecil the title to match his role as Principal Secretary. (Even then she held back; the text of the warrant states only that he was to be “one of the secretaries.”) Cecil was now able to go after the Stage with the full force of his position as the nation’s chief Minister of State. Three weeks after Cecil got his mandate, Hunsdon’s death put a stop to Burbage’s plans to turn the Parliament Chamber at Blackfriars into an indoor theater. In addition, instead of the post of Lord Chamberlain being passed on to Hunsdon’s 40-something son George Carey, it went to the aging William Brooke Ld Cobham, Burghley’s old friend and, since 1589, Robert Cecil’s father-in-law. Surely it’s no coincidence that Brooke, Hunsdon and Carey all lived right next to the Parliament Chamber, and to each other. 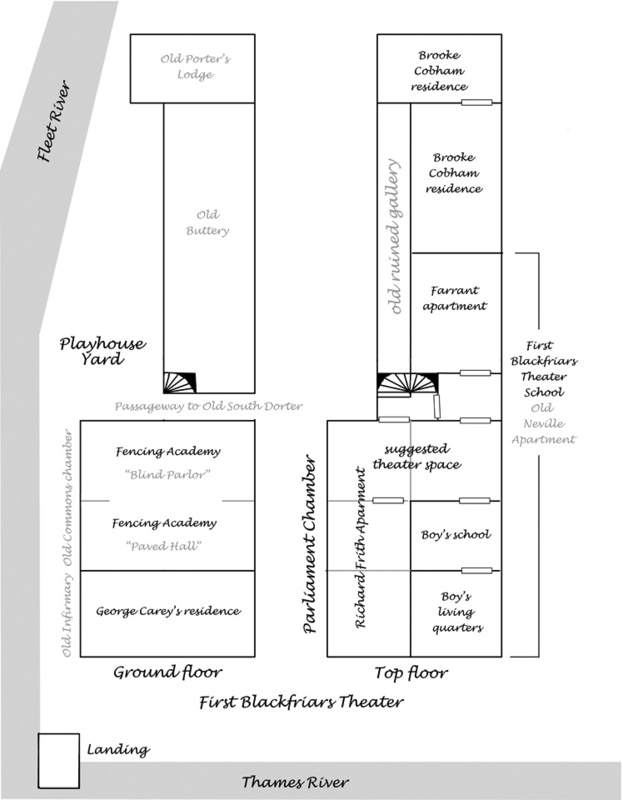 That November, 34 residents of Blackfriars signed a petition to prevent the theater from opening, prominent among them, Cecil’s aunt, Lady Russell (his mother’s sister) and Hunsdon’s heir, George Carey. To add to the Company’s woes, James Burbage died the following February. With his patron dead, his access to his Blackfriars theater denied by the Privy Council, his playwright once again “a forehorse to a smock, creaking his shoes on the masonry” at Hackney, and with his old stage in Shoreditch, the first round stage in England, the first commercially successful stand-alone theater in all Europe outside of Italy, shuttered and dark––the future must have looked too bleak for the poor old roustabout to keep on living. Either that or he too was eliminated by the vindictive Cecil. Burbage left behind two sons who, as servants of the earls of Pembroke, would create the London stage in its second immensely successful incarnation under King James: Cuthbert, its manager, and Richard, its lead actor. These two, with probably John Hemmings, originally with Lord Strange, now stage manager for Hunsdon, together with Oxford and Bacon, must have decided the hell with it, we’re not dead, we have a mighty weapon, let’s use it! Oxford would do a rewrite of the True Tragedy turning Richard into Cecil and Bacon would see to getting it published (see the Northumberland Manuscript). Since the demise of Fisher’s Folly, Francis and his brother had continued the University Wits sub rosa secretarial service in their suite at Gray’s Inn. By 1597 Francis was in a position to know all the printers, and like Oberon’s Puck or Prospero’s Ariel, could get a number of things done that Oxford himself could not. If you wonder why Oxford, Bacon, Sussex, Hunsdon, and Charles Howard, the Lord Admiral, were so set on having a theater at Blackfriars, read the list of names present in Commons for that Parliament, getting on committees, promoting bills, and for all the parliaments before this and after, just about every name we know from the history of the period. For during Parliament all the most important men in England could be found together in this one small community for several weeks on end, a session that was broken only by the Christmas and New Year’s holidays, when the tradition was to make merry, that is: eat, drink, sing, dance, and see one or more plays. Someone, my guess is that sometime in June 1597, Bacon (probably Oxford was also involved) gave Pembroke’s Men The Isle of Dogs, which had to be a satire, probably with a lot of extemporizing, possibly with commentaries on the gruesome executions of poets like Marlowe, Campion, and most recently, poor Robert Southwell. In August, the torturer Topcliffe let Cecil know that bad things were being said about him at the Swan Theater. Cecil responded by closing all the theaters until October, pursuing two of the miscreants, Shaw and Spencer, to prison, Nashe “escaping,” to Gray’s Inn (not Yarmouth). Forced to go on the road because there was not a theater left open in London, and faced with no theater available that gave access to the Parliament set to take place in October, Oxford either wrote Shakespeare’s Richard III––or, perhaps more likely, rewrote it––making the identification with Cecil as damning as possible. My guess is that if the Lord Chamberlain’s Men did play it on the road, it was only at the homes of sympathetic lords and officials, not for the public. For so long as the Company refrained from sharing it with the public, the threat that they would at some point kept the issue at a slow boil. Certainly they must have performed it, but history is silent as to when and where, as it is on so many points. It may be that the fact that there is no murmur in the record of the immediate response to the play, performed or published, may show better than anything the power of its impact and the need on one hand for the audience to keep their opinions to a cautious whisper and on the other, for Cecil to spend the rest of his days erasing from the record anything that could call attention to it. In hindsight it comes clear enough, for the continued comparison in later squibs and anecdotes of Cecil to Richard III, as Croft, Hotine and Aune show, could only have come from the play and not just the published version, but the performed version as well, for we are told that it was as Richard III that Richard Burbage first made his reputation as a great actor. Awareness of what everyone was saying and concern that there would be more trouble were the actors given access to the Blackfriars Theater, and through it all of the West End (and through that, all the world), suggests that the Privy Council, including Carey and the Lord Admiral, agreed to keep the theater closed to Shakespeare’s Company. There was no stopping the publication of the play; that genie could not be put back in the bottle; the publisher now owned it and could not without some notoriety be forced to stop making use of it. But it could be that Ld Chamberlain Carey, now on the Privy Council, agreed that, to keep the peace, the Blackfriars Theater would remain closed for the forseeable future––that is, to the adult company, since three years later it was leased to a new boy’s company. That this angered Oxford is obvious from Hamlet’s complaints in Act II Scene 2 about the “little eyeases” who “so berattle the common stages” that everyone is in fear of their “goosequills,” meaning the witty lines being given them by the new generation of playwrights: Ben Jonson, John Marston, Fletcher and Beaumont. Few have noted that Hamlet’s response to Guildenstern’s comment that the boys “carry it away” is something of a non sequitor: “It is not very strange; for my uncle is King of Denmark, and those that would make mows at him while my father lived give twenty, forty, fifty, a hundred ducats apiece for his picture in little (Claudius’s miniature).” Hamlet’s mind has been seized, once again, by his obsession with the royal murderer, whom everyone “made mows at” (sneered at) before the Old King’s death. Perhaps the author had in mind all those courtiers who now fawned so obsequiously on the Earl of Salisbury who, before the death of Walsingham, were fond of making “mows” (nasty faces) at Robert Cecil.